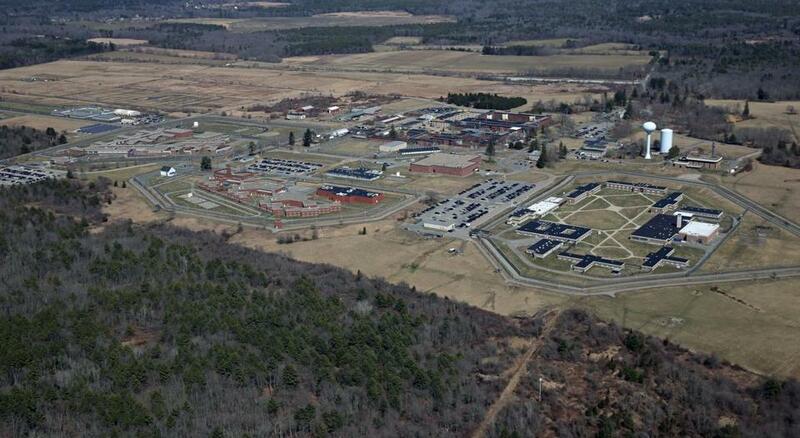 An aerial view of Bridgewater State Hospital. A federally funded watchdog group has launched an investigation into the alleged abuse and neglect of inmates at Bridgewater State Hospital, interviewing staff and inmates this week about reports that guards and clinicians are illegally putting mentally ill men into physical restraints and isolation cells. Lawyers from the Disability Law Center, designated under federal law to investigate complaints about the abuse of disabled people, converged on the medium-security prison Tuesday to meet with administrators, gather records, and meet with patients, the Department of Correction confirmed Wednesday. “We are acting pursuant to our concern that individuals with mental illness are subject to abuse and neglect at the facility, including but not limited to a deep concern about the amount of restraint and seclusion,” the center’s executive director, Christine M. Griffin, wrote in an April 8 letter to state Public Safety Secretary Andrea Cabral. If Disability Law Center officials conclude they have found wrongdoing, they could file a federal lawsuit against the state to force changes. In 2007, the center sued the department over allegations that the state’s prison system was subjecting mentally ill prison inmates to cruel and unusual punishment by placing them in solitary confinement for long periods and won significant concessions. Some are dangerous convicted criminals referred from other prisons, but others have been accused of only minor offenses and have never been criminally convicted. In 2009, a 23-year-old mental health patient who was accused of assaulting a staff member in a psychiatric facility died as prison guards were strapping his wrists and ankles to a small bed. After the Globe reported the case of Joshua K. Messier, Governor Deval Patrick disciplined a half-dozen correction officials involved in the case. The Globe also found that the use of restraints and seclusion by clinicians and prison guards rose 27 percent in the years following Messier’s death, despite a decade of promises to cut down on the use of those measures and a policy to “prevent, reduce, and strive to eliminate” them. Messier’s parents sued the state and the firm that provides mental health services at Bridgewater and were awarded a $3 million settlement. Meanwhile, another parent has filed a suit alleging that her son has been held in seclusion and restraints 70 percent of the time over the last 14 months, even though he has never been convicted of a crime. A Norfolk Superior Court hearing on the lawsuit, concerning the treatment of Bridgewater inmate Peter Minich, is scheduled Thursday. The Disability Law Center, which receives most of its funding from the federal government, is particularly feared at the Department of Correction. When the center began a preliminary investigation into the death of Messier in 2009, internal e-mails show that staff members reacted with alarm. Karin Bergeron, then Bridgewater’s superintendent, e-mailed a superior to say that producing a report on Messier’s death “became bigger than a breadbox when the DLC entered the picture.” Bergeron also said she was worried about “the potential for disaster here” if the report fell into the center’s hands. The suit was settled two years ago, after the department agreed to minimize use of isolation for mentally ill inmates and provide specialized housing units for mentally ill inmates who may be violent. The settlement also followed a Globe Spotlight Team investigation, which found that inadequate care for mentally ill prisoners often resulted in suicides. A US judge in Boston will continue to oversee whether the state complies with the agreement for another year. The center has periodically come to the aid of individual Bridgewater patients. In 2007, it interceded with Bridgewater officials on behalf of Timothy Grabosky, a former Bridgewater patient who said he had been held illegally in isolation on numerous occasions. But the center dropped its investigation into the death of Messier when lawyers were persuaded that other investigators, including Plymouth District Attorney Timothy J. Cruz, were looking into the matter. Cruz never pursued criminal charges, even though Messier’s death was ruled a homicide. But last month Patrick placed three of the guards involved in Messier’s death on paid administrative leave, pending disciplinary proceedings, and reprimanded Commissioner Luis S. Spencer and Bridgewater Superintendent Robert Murphy for failing to take action on official reports on the use of force involved in Messier’s death. Spencer has also faced criticism for not personally reviewing Bridgewater State’s use of restraints and isolation, despite a state law calling for him to “review and sign within 30 days” all seclusion and restraint authorization forms at Bridgewater. Spencer said in an interview that he is following the law by having experts in his department review the forms, but outside experts on seclusion and restraint say his leadership is crucial for the prison to change its outdated practices. “If the senior leadership are not fully engaged from the very beginning and have a commitment to be fully engaged for a number of years, it won’t work,” said Kevin Huckshorn, a noted expert in cutting the use of seclusion and restraints who is also director of Delaware’s Division of Substance Abuse and Mental Health.